According to Euromonitor International, cross global distance selling sales amounted to €616 billion in 2013, which is a whopping $765 billion – and it seems that everyone wants their piece of the pie. However, capturing a slice of this pie is not easy because simply making your products available in this global economy is not enough. Merchants need to have a clear understanding of buyers and their shopping habits to really be successful. Businesses selling to consumers around the world face unique challenges when trying to break into new markets. As you would expect, shopping habits vary from country to country, and culture to culture. It is important to understand these differences to decide where (and where not) to focus your efforts. 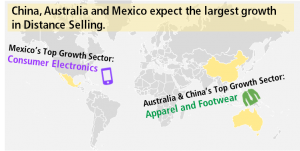 From Deutsche Post DHL’s Shop the World study, we see that China, Mexico and Australia expect the largest growth in distance selling – but greatly vary in their characteristics. 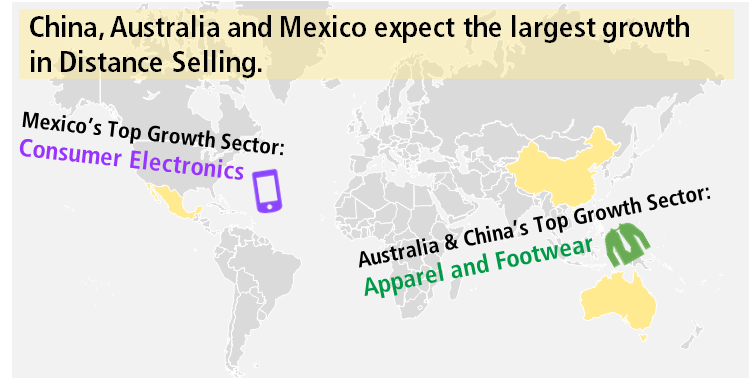 For instance, Australia and Canada’s top growth sector for the future is apparel and footwear, but Mexico’s is consumer electronics. The study also notes that China’s use of distance selling is far beyond that of the global average (92% compared to 83.5%), which we will continue to see increase as global e-commerce grows. While looking at our neighbor to the south, Mexico, we cannot forget our prospering northern neighbor, Canada. Currently, Canada is our largest goods trading partner, making them a key player for many U.S. businesses. With 30 million of the 34.7 million inhabitants online, they have embraced buying goods from other countries, when compared to the global average. The Shop the World study found that Canadians enjoy buying media products online, and that the sector is projected to almost double by 2018. On the other hand, we learn that Canadian residents will not be looking to the world for household and consumers appliances in the foreseeable future. Knowing which markets to focus your products on will better prepare your company for the exciting road of growing your business internationally!